I mentioned several times this month that this holiday season I have been obsessed with everything gingerbread… the treats, décor, scents, etc. This is clearly evident by the all the gingerbread recipes I have shared on here on Kitchen Concoctions. But one holiday treat that I cannot turn my back on are Peppermint Mocha and Peppermint Hot Cocoa! I just love how the subtle hint of peppermint compliments the rich chocolate and pairs so well with the coffee flavor. 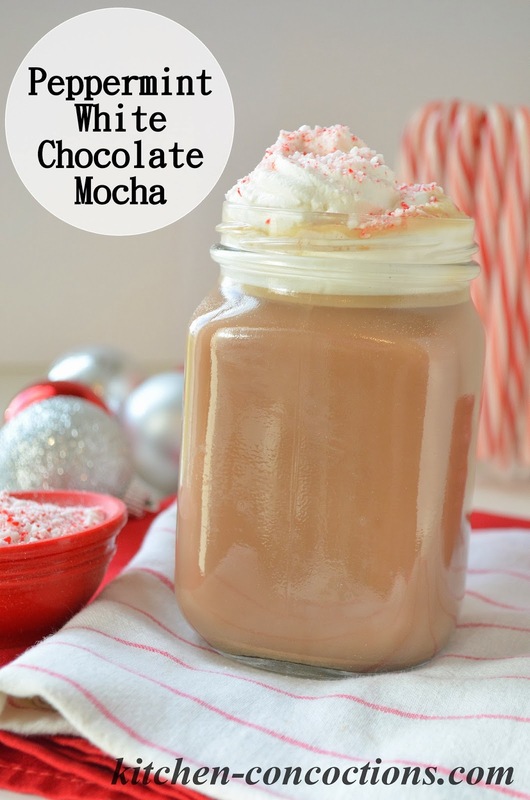 My homemade version of this popular seasonal coffee shop treat, is inspired by my recipe for a homemade White Chocolate Mocha. I have made this festive holiday version, loaded with peppermint and white chocolate flavor then topped with a generous amount of homemade whipped cream, several times over the past few weeks. This recipe is really a breeze to whip up and can easily be made with whatever peppermint ‘thing’ you have lying around. I have made it several times with crushed candy canes, other times I omitted the candy canes and white chocolate chips altogether and just threw in a couple of Hershey’s Candy Cane Kisses. And for an even richer peppermint flavor try melting a York Peppermint Patty right into the warm milk/coffee mixture. To.die.for. And if you have none of those things some peppermint extract will work just fine too! 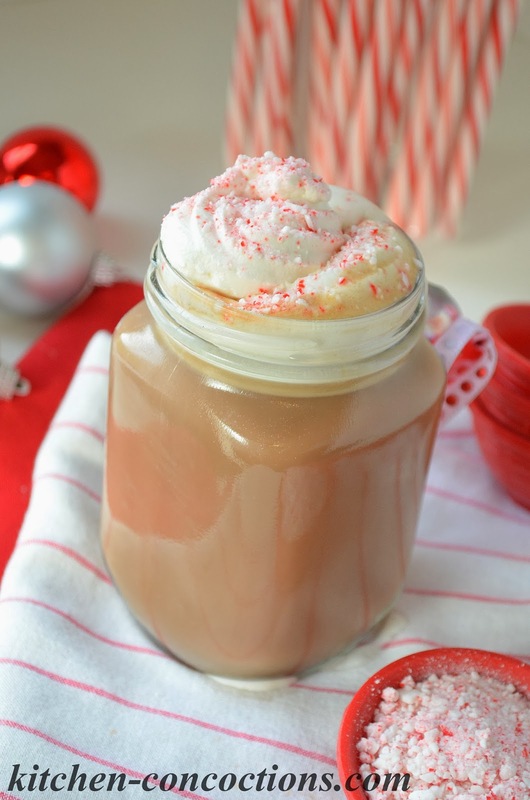 So no excuses as to why you can’t a festive homemade Peppermint Mocha! Combine coffee, milk, crushed candy canes and white chocolate chips in a small saucepan. Bring to a simmer over medium high heat. Whisking constantly, simmer for 1-2 minutes. 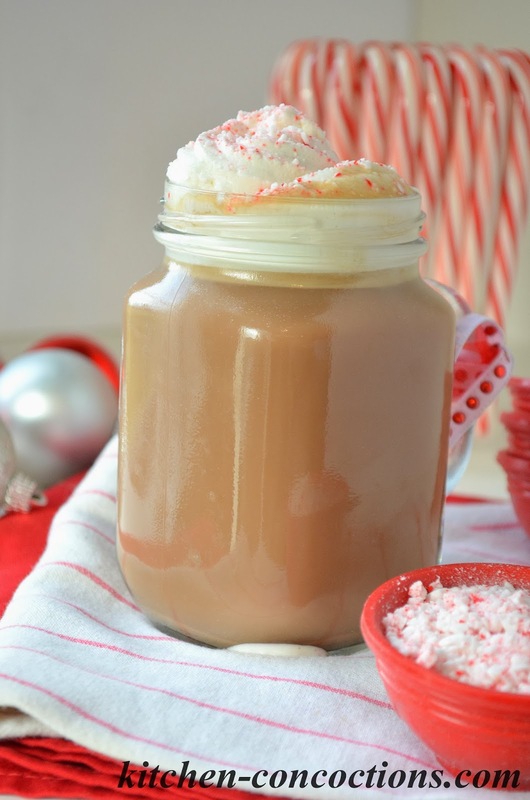 Pour into a large mug, and top with whipped cream and additional crushed candy canes. Serve immediately. NOTE: If you don’t have any whipped cream on hand add additional 2-3 tablespoons of milk, if desired. Omit white chocolate and crushed candy canes and add two Candy Cane Kisses. Omit crushed candy canes (and white chocolate, if you wish) and add one fun sized Peppermint Patty. Omit crushed candy canes and add ¼ teaspoon peppermint extract.